With the first 19 games being played away from home, the University of Evansville Softball team will finally be at the friendly confines of Cooper Stadium today as the Purple Aces welcome Northern Illinois for a doubleheader. Game one is set for a 3:00 p.m. start with the second match-up beginning at approximately 5:00 p.m.
Live stats will be available for both games. Evansville begins its home schedule with a 7-12 mark playing one of the toughest schedules in program history. Over the weekend, the Aces faced a pair of top 19 squads, going 2-2 in the John Cropp Classic in Lexington, Kentucky. The Aces picked up victories over Dayton and Drexel while the lone losses came to #19 Kentucky and #17 Michigan. Hayli Scott leads the way for UE with a .367 batting average. One of the top clutch hitters on the team, she has notched several big hits thus far and has been rewarded with nine RBIs for her work. Sophomore Morgan Florey has done it all in the circle and at the plate. Florey has batted .306 with two home runs and a team-high 10 RBIs. She has pitched in 57.2 innings while striking out 74 batters. Florey’s ERA stands at 2.31 while she has won five games on the season. Senior Chandra Parr continues to chase history as she currently has 28 home runs in her UE career. She is just two away from tying the all-time program mark of 30, which was set by Krista Price in 2010. Northern Illinois is an even 9-9 on the season and is coming off of a 1-3 showing at the Murray State Tournament as they split a pair of games against Austin Peay while dropping both match-ups against the host Racers. Kayti Grable and Jessica Rio lead NIU with a .380 average. Grable is a strong power hitter who leads the team with three home runs and 12 RBI. Rio has gotten the job done when getting on base, pacing the Huskies with 13 runs scored. The members of UE Leadership Academy will be hosting Honoring our Vets Donation Drive this week – March 13-17. They are collecting personal care/hygiene items. Collections boxes are in each residence hall, CSE, and the admissions office. Thank you in advance! The UE Bookstore is offering 20 percent OFF all NIKE purchases this week, March 13-17. The discount will be taken off the original price of item and includes shorts, T-shirts, and sweatshirts. Sale ends Friday, March 17! This week's I-House presentation will be on India with a special event related to a holiday widely celebrated there called Holi. Be sure to come by tonight as Kunal Mukherjee and Jasneet Singh tell us all about their home and this wonderful holiday. Be there at 7:00 p.m. this evening, upstairs in Ridgway University Center! The University of Evansville’s Creative Writing Coffee Hour Wahnita DeLong Reading is today at 4:00 p.m. in the Melvin Peterson Gallery. UE professors emeriti Bill Baer and Margaret McMullan will be the speakers. This event is free and open to the public. Baer, a recent Guggenheim fellow, is the author of 20 books. His poetry collection “Bocage” and Other Sonnets was the recipient of the X.J. Kennedy Poetry Prize. His other books include The Ballad Rode into Town; Psalter; and The Unfortunates, recipient of the T.S. Eliot Award. A former Fulbright and recipient of a N.E.A. Creative Writing Fellowship, Baer was founding editor of The Formalist and founding director of the Howard Nemerov Sonnet Award. He is the author of the short fiction collections Times Square and Other Stories and One-and-Twenty Tales, and his plays have been performed at more than 30 American theaters. McMullan is the author of seven award-winning novels, the story collection Aftermath Lounge, and editor of the anthology Every Father’s Daughter. Her work has appeared in such publications as The Los Angeles Times, The Washington Post, and The Chicago Tribune. She is a National Author Winner of the Eugene and Marilyn Glick Indiana Authors Award, and received an NEA fellowship and a Fulbright to research and teach in Hungary for her new memoir Where the Angels Lived: One Family’s Story of Exile, Loss, and Return. She currently serves as a faculty mentor at the Stony Brook Southampton Low-Residency MFA Program. Earn HRA credits by participating in the Spring Healthy Behavior Challenge. E-mail ac375@evansville.edu to sign-up. The challenge begins March 20! This is an eight week competition to support a healthy lifestyle. HRA credits will be issued upon successful fulfillment of some basic healthy behaviors. Employees and insured spouses enrolled in the HRA health insurance program will earn a $150 credit. If a credit was earned previously (summer 2016, or fall 2016), no additional credit will be issued. Anyone who finishes in the top four will receive a $50 gift card regardless of previous gift-card winning status. You must submit eight weeks of data. You can pick up additional pocket-sized logs from the UE Health and Wellness Center. Eat a combination of five fruits and vegetables at least four days a week and exercise an average of 120 minutes weekly (your log needs at least 160 fruit/veggie boxes checked and 64 exercise boxes checked). Check off boxes daily to avoid “guesstimation” later. Additional logs can be picked up from the UE Health and Wellness Center or on AceLink. Return logs to the collection box at the UE Health and Wellness Clinic or by e-mail to ac375@evansville.edu by May 6. HRA credits will be submitted to Meritain by May 13. Pianist Philip Thomson will present a guest recital this Sunday afternoon, March 19, at 4:00 p.m. in Wheeler Concert Hall. Canadian born pianist Thomson has been on the piano faculty at the School of Music at The University of Akron since 1994. He came to international attention in 1991 when he made the world premiere recording of Liszt's De Profundis with the Hungarian State Orchestra. Sunday's program includes a variety of works by Bach, Schubert, Grieg, and Blumenfeld. The program closes with several movements of Liszt's Harmonies Poetiques et Religieuses. This event is free and open to the public. Cynthia White, mezzo-soprano, senior recital, at 1:00 p.m.
Samantha Waddell, piano, junior recital, at 2:30 p.m.
Adam Smith, bass-baritone, junior recital, at 4:00 p.m.
Grayson Gerni, guitar, senior recital, at 1:00 p.m.
Kelsey Fields, soprano and Laura Dalto, guitar, senior recital, at 2:30 p.m.
SAB will be sponsoring comedian Gibran Saleem on Friday, March 17, at 9:00 p.m. in Café Court. Drinks and popcorn will be available, and entrance is free! Men’s Basketball legend Andy Elkins highlights the 2017 Lunch with the Aces event, which will take place on Friday, March 31, at the Meeks Gym inside the Carson Center on the University of Evansville campus. Elkins, who graduated from UE in 1995, led the Men’s Basketball team to two NCAA Tournament appearances and one NIT berth in his four years with the program. He ranks sixth in program history with 1,761 points in his career. A record crowd of over 400 was on hand for the 2016 event, and this year’s lunch also promises to be a memorable one. The full lunch runs from 11:00 a.m.-1:00 p.m. with the program beginning at 12:30 p.m. Early registration for your spot at the lunch is just $30. The cost will be $35 after 5:00 p.m. on March 27 and at the door. A Spring Break Special features $15 tickets for those 15 and under. Another new opportunity is available as you can now sponsor a UE student-athlete for just $10. The meal will be provided by Marx BBQ while a video presentation will be shown at the program. A half pot and silent auction will also be on hand. A Purple Aces student-athlete will be seated at each table, and the latest Student-Athletes of the Year will be recognized at the lunch. Corporate tables are available for $350 and come with several unique perks. You receive a table at the front of the room, logo on the video screen, logo in the program, recognition by the emcee, and two student-athletes seated at each table. Each corporate table has eight seats. All proceeds directly support UE student-athletes. For more information, contact Shelbie Weaver at 812-488-1024 or at sw260@evansville.edu. The International club is going to Saint Louis for the weekend of March 25. Sign-ups will be today from noon-2:00 p.m. and Thursday, March 16 from 5:00-7:00 p.m. Questions? E-mail sw228@evansville.edu. 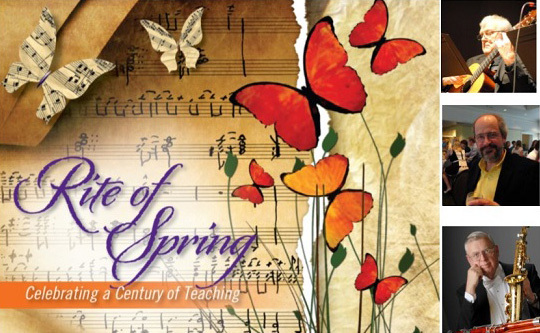 The Rite of Spring will be held on Saturday, March 25, beginning at 6:00 p.m., in the Executive Conference Center at the Tropicana Evansville. 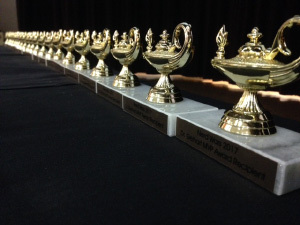 In addition to celebrating the three honorees, the evening will includes cocktails, dinner, a musical program, jazz and dancing with the UE Jazz Ensemble, and a silent auction. Tickets are $65 per person and are available now. For tickets or more information and to register on-line, visit the Rite of Spring web page or call 812-488-2754. Each staff employee and their guest are invited to attend the Staff Appreciation Dinner at the Log Inn on Wednesday, April 5. The social hour (cash bar and appetizers) begins at 6:00 p.m. and dinner will begin at 7:00 p.m. Please join Dr. Kazee in the presentation of staff service awards and for the presentation of the Staff Employee of The Year Award. Invitations will be sent to staff employees via UE campus mail in the next week. Please contact Human Resources at ext. 2943 if you have any questions. Volunteers are needed to help Aurora, a local non-profit, move office locations. Shifts are from 9:00 a.m.-noon and noon-3:00 p.m. Lunch, a free T-shirt, and transportation will be provided if necessary. Register via Get Connected. Sigma Alpha Epsilon will be hosting its annual Paddy Murphy Pageant on March 17 at 7:00 p.m. in Eykamp Hall, Ridgway University Center. Tickets will be available for sale from March 13-17 in Ridgway University Center lobby for $5 and at the door for $7. All proceeds this year will benefit Chemo Buddies, a local group that provides support to cancer patients. GAP info and pizza session today! Come learn about GAP TODAY from noon-12:50 p.m., in Room 162, Schroeder School of Business Building. ALL majors welcome! Put your skills to work on a real-world project, get valuable experience and build your résumé, learn to work with people from different majors, develop professional confidence, and get the coaching and guidance needed to succeed! To apply or learn more about the GAP Program, visit the website at www.evansville.edu/gap. UE mechanical engineering students of ME344 and ME434 visited HMC Gears, Inc., prior to spring break. HMC is located in Princeton, Indiana, and specializes in the international supply of very large custom designed gearing, with some gears measuring 26 feet in diameter. The company’s market is associated with ore mining equipment, but recently HMC has broadened its customer base to include processing mills and power plants. The students toured the engineering, welding, machining, grinding, and quality areas and participated in a Q&A session with HMC engineering and human resources personnel. HMC Gears Inc. is currently looking for a graduate with a bachelor of science degree in mechanical engineering, and some of the students were able to initiate conversations with the company’s human resources personnel during the tour. The visit was facilitated by Pete Stremming, HMC applications engineer and 2016 UE mechanical engineering graduate. Reminder: Study abroad deadlines fast approaching! For any students interested in studying abroad through a non-Harlaxton program for the Spring 2018 semester: there’s still time! Study abroad applications are due by April 1. If you’re interested, stop by Room 261 in the Schroeder School of Business Building or e-mail studyabroad@evansville.edu for more information. There are also still a few spaces left for Harlaxton Spring 2018! E-mail studyabroad@evansville.edu for more information. The Center for Career Development is excited to introduce an online scheduling system to make creating Career Center appointments easy and quick! Simply visit the Career Center website and click the “Schedule an Appointment” box. The City of Evansville is promoting the use of public transportation by offering FREE trips on METS on Thursday, March 16, from 5:45 a.m.-4:00 p.m. Metropolitan Evansville Transit System will offer free bus transportation for all passengers. AmeriCorps is a federally funded community-service program open to people of all ages! It's a great option for those looking to give back after they graduate. You can check out more about Americorps by visiting the Americorps page on the Corporation for National & Community Service website. The process for students with 44 plus earned credit hours who wish to select a room in their current residence hall for next year takes place on Tuesday, March 14, from 9:30-10:30 p.m. in Eykamp Hall, Ridgway University Center. If you are interested in reserving a room in your same residence hall for next year, please go to Eykamp Hall then. The building staff will be ready to assist during these times. If you would like to switch buildings for next year, submit a housing contract on WebAdvisor and do not sign up for a room in your same hall. You will receive an appointment time on March 20 indicating when you can select a room in a different hall next week. The process for students with 43 earned credit hours or less who wish to select a room in their current residence hall for next year will take place from 9:30-10:30 p.m. on Wednesday, March 15, in Eykamp Hall, Ridgway University Center. If you are interested in reserving a room in your same residence hall for next year, please go to Eykamp Hall then. The building staff will be ready to assist during these times. The Office of Study Abroad is introducing UE Stories Abroad! Check in to hear from students who have gone abroad and read about where they studied, their challenges, and the most rewarding parts of their trip. They will also have some great advice for any future study abroad students. The first story comes from Kristen Sholander, a third year DPT student who studied in Mexico. Read Kristen’s story on the UE Stories Abroad web page. Summer assistant applications are still available to be picked up in the residence life office. If you are planning on staying on campus this summer, and would like the chance to get free housing, this is a great opportunity! There will be one more information session on Wednesday, March 15, at 7:00 p.m. in Room 126 in Hyde Hall if you want more details. Applications are due to residence life by 5:00 p.m. on March 17. Heidi Strobel, associate professor of art history, was recently accepted to the Council of Independent Colleges seminar at the Yale Center for British Art in New Haven, Connecticut. The seminar, “Landscape and Identity in Britain and the United States (1770-1914)” will take place in late July of 2017 and will focus on Hudson River School landscape artists Thomas Cole and Frederic Church. Schroeder Residence Hall has won the Recyclemania Pledge Contest between residence halls! Also - congratulations to Jess O’Shaughnessy – her name was drawn from all the residents of Schroeder Residence Hall who signed the recycling pledge. Jess has won a Smart Strip Energy Saving Surge Protector. Thanks to Brian Conner for drawing the winning name from those submitted! Congratulations to Mason Mobley, Jayne Schnacke, and Simon Earle for having your names drawn to win a Jazzman’s beverage coupon for signing the Recyclemania pledge. Thanks to Lisa Kretz for drawing the winning names from those submitted! Please note that Recyclemania continues until the end of March, so remember to recycle all you can. Information on UE’s recycling program, including what to recycle and where to take your recyclables can be found in the UE recycling guide located on AceLink under Areas under Recycling. E-mail js652@evansville.edu or call ext. 2697 with any questions. Camary Williams’s breakout season was further honored on Thursday evening as the senior guard became the third-ever University of Evansville Women’s Basketball player to lay claim to the Missouri Valley Conference’s Defensive Player of the Year award. The honor was presented between opening round games at Hoops in the Heartland on Friday evening. Williams, a native of Ft. Myers, Florida, made the leap from a reserve a year ago to one of the best guards in the Valley this season. Despite standing at just 5 feet 5 inches, she will enter Friday’s meeting with Missouri State as the third-leading rebounder in the conference with 7.9 per contest. She also boasts the second-best steals mark in the NCAA this season, swiping just under four per game. Williams has come away with 115 steals so far this season, which is the fourth-best mark in MVC history. It broke the school record set by Latasha Austin in the 2001-02 season. Williams’s defensive prowess has often led to points on the other end for the Aces, and she currently ranks sixth in the league at 14.1 points per game. Williams is the first UE player to win Defensive Player of the Year since Rebekah Parker in 2007. Austin is the only other Ace to win the award, taking it home in that record-setting season 15 years ago. Averaging 25.5 points per game in the University of Evansville Men’s Basketball team’s two games at Arch Madness, senior Jaylon Brown earned a spot on the All-Tournament Team. Joining Brown on the team were Landry Shamet (WSU), Conner Frankamp (WSU), Paris Lee (ILS), and Alize Johnson (MSU). Frankamp was named the Most Outstanding Player. Brown started the tournament with 27 points in an 83-72 win over Indiana State. He also grabbed eight rebounds and hit three triples in 39 minutes of work. He was 9-of-19 from the field and added six free throws. In a matchup against #1 seed Illinois State, Brown had another stellar game as the Aces rallied to get within four points of the Redbirds in the final minute. He finished the game with 24 points while hitting all eight free throws and dishing out four assists. He played just under 40 minutes. He finished up his senior season leading the MVC in scoring (20.9 points per game) and minutes (36.8 minutes per game). Brown finished up the season scoring 20 or more points in the final six contests while scoring double figures in all but one game in the 2016-17 season. The honor for Brown marks the second year in a row that he earned a spot on the All-Tournament Team. D.J. Balentine was also honored twice, in both 2014 and 2016. Prior to 2014, the only UE player to be named to the squad in the school’s tenure in the MVC was Marcus Wilson in 1999. Senior David Howard has excelled in the classroom and on the floor and was recognized on Thursday for his accomplishments as he was named to the Missouri Valley Conference Scholar-Athlete First Team. The accounting major from Nashville, Tennessee, had one of the top GPA’s on the University of Evansville Men’s Basketball team, sitting at 3.56. It was also the second-highest among those named to the First Team. Howard has enjoyed the best year of his career in 2016-17, setting career highs in all categories during the season, highlighted by a career-best 21 points earlier this season against Drake. Joining him on the First Team were Clayton Custer (Loyola), Ben Richardson (Loyola), Austin Ruder (Missouri State) and Reed Timmer (Drake). The criteria for the Missouri Valley Conference’s Scholar-Athlete Team voting parallels the CoSIDA (College Sports Information Directors of America) standards for Academic All-America voting. Nominees must be starters or important reserves with at least a 3.20 cumulative grade-point average (4.0 scale). Student-athletes must have reached sophomore athletic and academic standing at their institution (true freshmen and redshirt freshmen were not eligible) and must have completed at least one full academic year at their institution. He must have played in 75 percent of his team’s games. Congratulations to Su Jin Jeong and her husband Tae, and big sister Lillia on the birth of baby girl, Elenora, on February 25. Su Jin is an assistant professor in the School of Health Sciences. The Honors Activity Board and the Honors Program wish to thank SGA for its financial support and the campus community for participating in the 2017 Nerd Wars trivia night on February 28. Your participation allowed us to raise $580 for Honors Ace Mentors (HAM), a group of honors students who volunteer to support students in the EVSC with tutoring and cultural enrichment and by serving as positive role models. The winning student team was Apollo's Raider's (Evan Pierce, Jacob Meyer, Shawn Leedy, Preston Wagner, and Thomas Jandebeur). The winning faculty was Consilience (Joyce Stamm, John Stamm, Ann Powell, Dan Byrne, and Kristie Hochwender). In memory of Dr. Gerhart, dean of the college of engineering and computer science who recently passed away, each of the 21 teams selected a player to receive a Nerd Wars 2017 Dr. Gerhart MVP trophy. Dr. Gerhart was a frequent participant in Nerd Wars over the years. Harlaxton College has been awarded a grant by Historic England (the public body that looks after England's historic environment) towards the cost of a Parkland Management Plan (PMP) for Harlaxton Manor and surrounding parkland. The PMP will provide an understanding of the development of the park, its significance and current condition; identify essential repairs and establish policies to secure the future of the historic designed landscape, facilitating its removal from the Heritage at Risk register; and assist the College in identifying a vision and management strategy for the future of the park that integrates it fully with the rest of the site, and the educational and other aims and activities of Harlaxton College.